Misty When Misty came to us, she most recently had been living with a lady, who got Misty two months previous via a "Free to good home" ad in the newspaper. Before that, Misty had been living with an elderly couple, who were getting too old to care for her. The couple had gotten Misty from someone in PA. The lady, that had Misty, also had two other dogs and three kids. She felt that Misty was not happy there; all the noise made her nervous. Plus, the husband didn't like Misty and wanted her taken to the pound. The problem seemed to be the latter. Our experience was quite different. When we took her to the vet one day, there were seven children running around, banging on things, and she behaved like a perfect little lady. In fact, she was totally mesmerized by the little baby. 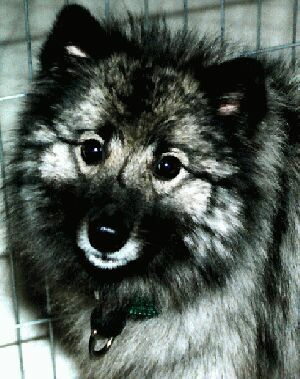 We were contacted by a great couple, who wanted to adopt a Misty. Their Samoyed had crossed Rainbow Bridge a few months earlier. They adopted Misty and a very lovable Samoyed, Spirit. (Love those fuzzies!) Misty had been moved around so much in her life, now she has what she always wanted; a real family and a home where she is loved and can stay forever.